When I was in high school, I worked summers on my aunt and uncles' farm in Utah(I might have to find some pictures of my farm life! Me on a tractor is fun!). It was a fruit farm, where they grew mainly cherries(the tart kind), as well as apples and peaches and had their own U-pick vegetable garden. Working on that farm has been a highlight of my life so far. From that experience, I learned to love apples. My parents have an apple tree in their backyard, it's a pretty mature tree and produces sooo many apples every year. We're not sure the kind of apple, but I think I've narrowed it down to the jonagold variety. In any case, every September we harvest apples. Recently(like the last few years), my mom and I have tried to figure out how to use as many of the apples as possible, before they go bad. We give some away(we can't possibly eat that many, it really does produce a lot, even after I've thinned the tree), but last year, my mom and tried a few new things. We made homemade apple butter, which was fantastic and became our Christmas gift to people and then we canned a bunch, turning them into apple pie filling. Just add a few spices and other ingredients and voila-ready anytime apple pie filling. Last weekend, my mom brought me down some jars of this apply and cinnamony goodness and I made apple crisp with it this weekend and it was really good. But what was even more great about it, was using something my mom and I had made. It was so satisfying to use something we had grown, harvested and canned ourselves. It was great. My mom said the tree produced even more apples this year, so more apple butter and filling is on the way! Anyway, I love apples! 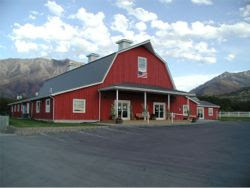 This picture is of the big red barn in Santaquin UT, where my uncles family sells their produce, it's kind of fun, stop there next time you head up off the South Santaquin exit on your way up I-15. Me too...HOW DID YOU DO THAT? And why won't anyone show me? Apple butter's the best... sorta like honey butter. butter=good, but when you add other things, it just makes it exponentially more good. Santaquin! HAHA... that little short black actor has a place there next door to a girl i dated. whatchoo talkin' bout Willis? p.s. good job on the update, it inspired maren to do the same. i might do some more additions to mine if i ever find the time. Da Vinci Code...and other random thoughts.